The remains of a massive stone monument, 15 times the size of Stonehenge and located just 2 miles (3.2 kilometers) away from the famous site, were recently discovered by British archaeologists. 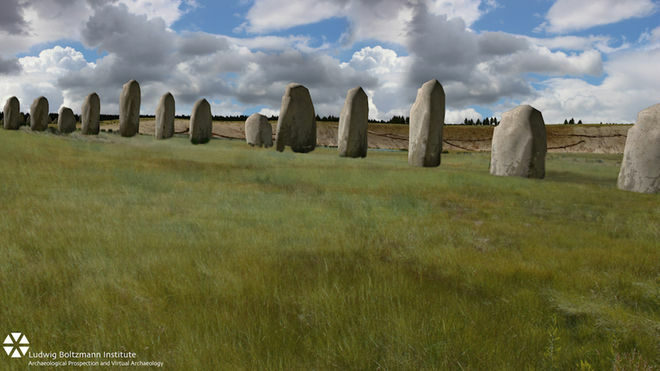 The stone monoliths were found buried beneath the bank of the Durrington Walls “super-henge,” one of the largest-known henges in the United Kingdom, and could have been part of a huge Neolithic monument, the researchers said. The finding announced at the British Science Festival in Yorkshire, could mean that everything researchers think they know about Stonehenge may need to be “rewritten,” according to Paul Garwood, a senior lecturer in archaeology at the University of Birmingham, in the United Kingdom, and the principal pre-historian for the Stonehenge Hidden Landscapes Project — the group that discovered the stones using noninvasive, remote-sensing technologies. It is not yet clear whether the stones were put in place at the same time as those of Stonehenge, nor do the researchers know how the stones were used. However, those who study the mysterious rock monuments of the U.K. previously thought that only Stonehenge and one smaller henge located near the famous monument featured significant stone monuments. Now they know that isn’t the case. Durrington Walls is also surrounded by a 58-foot-long (17.6 m) ditch that forms an enclosure around an area that is approximately equivalent to 1 mile (1.5 km) of land. Inside the bank of the henge are a few smaller enclosures and timber-ringed circles. The massive landscape monument is associated with a settlement dating back about 4,500 years, to the Late Neolithic period, the researchers said. The super-henge was constructed at the site of a natural depression in the landscape near the river Avon that was surrounded by a chalk scarp, or sharply edged hill. 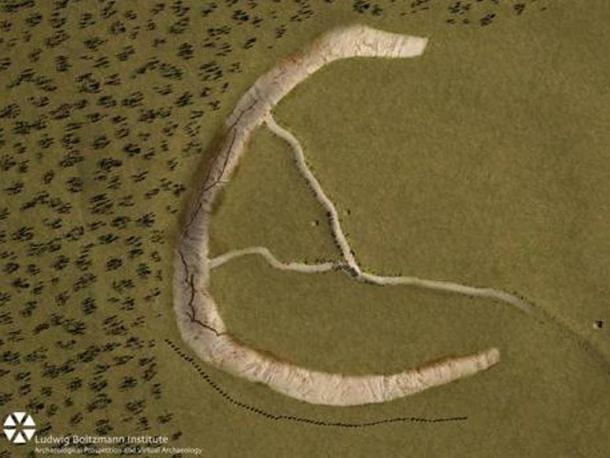 The newfound stones may have formed an artificial wall to the south of the hill, creating a C-shaped “arena” that once could have been the location of springs and a valley leading into the Avon, according to the researchers. While none of the stones have been excavated yet, the researchers think they could be related to the only large stone within the Durrington Walls henge. Known as the “Cuckoo Stone,” the presence of the 7-foot by 5-foot (2 m by 1.5 m) block of sarsen stone suggests that the buried stones may also be sarsen stones — the same, locally sourced stones that were used to build Stonehenge. “This discovery of a major new stone monument, which has been preserved to a remarkable extent, has significant implications for our understanding of Stonehenge and its landscape setting,” Vincent Gaffney, professor in the School of Archaeological Sciences at the University of Bradford in the U.K., said in a statement. While researchers have yet to excavate any of the stones, it’s possible that they were brought to the site of Durrington Walls at the same time that similar stones were brought to Stonehenge. Last year, Gaffney and other researchers with the Stonehenge Hidden Landscapes Project announced the results of a four-year survey of the landscape around Stonehedge. The survey was performed using the same noninvasive technologies, such as ground-penetrating radar, that led to the discovery of the huge stones under Durrington Walls.